These pinwheels were inspired by my trip to cooking school this fall. The chefs at cooking school grilled a piece of serrano ham wrapped manchego cheese and served it with our salad. It was amazing! I knew I had to come home and put my own spin on it. I decided to make these Serrano Ham & Manchego Cheese Pinwheels. They were fantastic. I had a hard time finding serrano ham, but I eventually found it at Sam's Club and World Market. Manchego cheese is readily available in the deli cheese section at the grocery store. 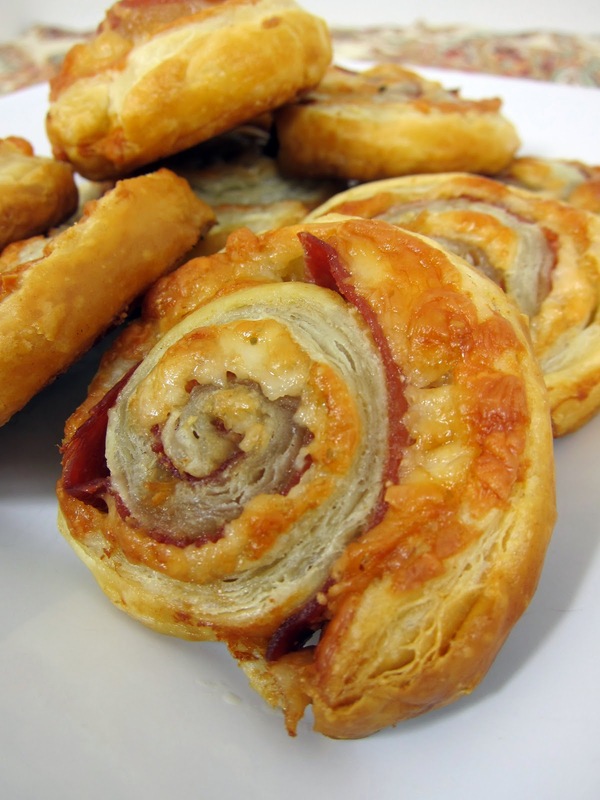 These pinwheels were delicious and would be a great addition to your Super Bowl menu on Sunday. Unfold the pastry sheet on the work surface, and top with the cheese. Top cheese with serrano ham. Starting at a short side, roll up like a jelly roll. Cut into about 16 slices. Place the slices, cut-side down, onto baking sheet. Bake for 12-15 minutes or until the pastries are golden brown. Serve with ranch dressing or brown mustard for dipping, if desired. These would not last long at all around my house. I love the flavor of manchego cheese and am glad it is becoming more available at my grocery store. I'm unfamiliar with both serrano cheese and manchego cheese, but these look really good so I'll be trying something new! I wish we had a World Market. Hi-Just got home from Sam's (in Burb of Atlanta) and a gentleman told me they didn't carry that ham. He was in the prepackaged area of the meat dept. Did you buy yours in the frozen section? If I can't find it, what ham would you say is the closest? They had the cheese, but it was in small triangular sections, ready for serving. Who says I can't grate small triangles? LOL Thanks for this great recipe ! Cece - it was in the refrigerated section near the blocks of cheese and meat. My Sam's and Publix has blocks of manchego cheese. You could try proscuitto if you can't find the serrano. It will be the closest thing. Love this idea. I get the best manchego from a local sheep farm just down the street from my house. Now if I can just get a pig farmer to make me serrano, ha ha. I could eat these as a meal along with a salad. They're beautiful! I can think of plenty of combos for this one. Try pepperoni and mozzarella with some pasta sauce on the side for dipping!! I made these for a 4th of July appetizer and they were a huge hit. Found the Serrano ham at World Market.